One to pencil in for the very end of the summer. Discover the World Education are offering a new CPD day. 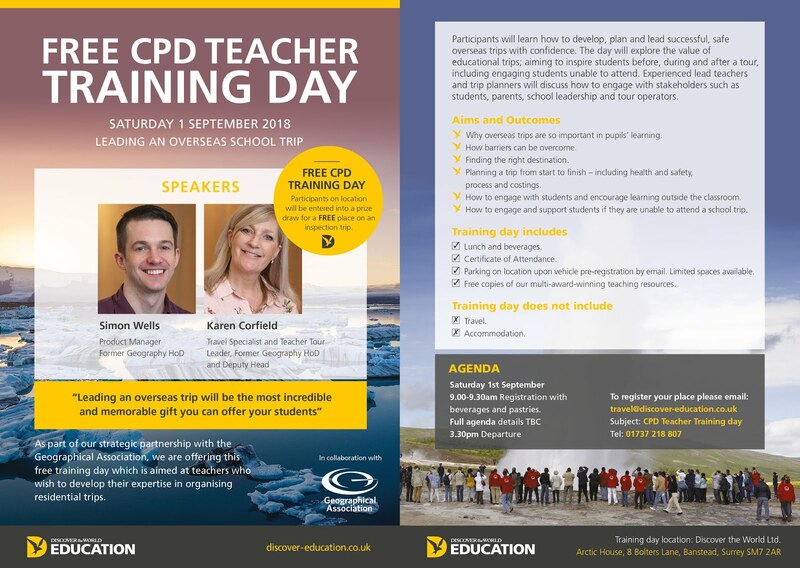 As part of our strategic partnership with the Geographical Association, we are offering this free training day which is aimed at teachers who wish to develop their expertise in organising residential trips. Participants will learn how to develop, plan and lead successful, safe overseas trips with confidence. The day will explore the value of educational trips; aiming to inspire students before, during and after a tour, including engaging students unable to attend. Experienced lead teachers and trip planners will discuss how to engage with stakeholders such as students, parents, school leadership and tour operators. Participants on location will be entered into a prize draw to win a free place on a teacher inspection trip.